Dr Mark Westman, founder of Pets in the Park, with a patient. Stylin outfit. (Yours isn't bad either, Mark). SAT Interviewed Mark Westman. PhD Candidate. RSPCA veterinarian. All round nice guy. Truly an example of someone who takes their vetting to a higher level. Who are you and what is your day job? 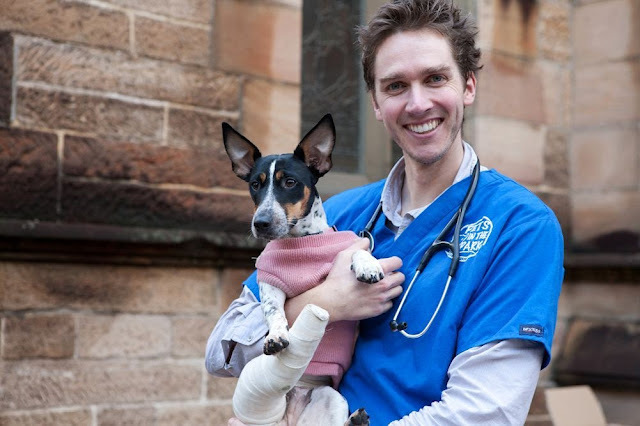 I graduated with a BVSc (Hons) from Sydney Uni in 2003, and my primary passions are shelter medicine and non-invasive companion animal research. I have been able to combine these two passions together by working part-time as a veterinarian at the RSPCA and commencing a full-time PhD at the University of Sydney. My research encompasses feline GIT parasites and feline retroviruses, and in particular my project is investigating the protective rate of the FIV vaccine under field conditions. My fantastic supervisors are Prof Richard Malik and A/Prof Jacqui Norris. Are there any significant non-humans in your life? If so, who are they, how did you meet and what is your relationship like? Dookie is my 15 year old Fox Terrier who has been with me since I first started university. Like many pets, she has been a constant and faithful companion through the highs and lows that life brings. She was also the first dog that I ever diagnosed with Addison's disease! She is the sweetest dog I have ever known, and I dread the day when I will have to learn to cope with her absence. My other dog, Chewie, died last year under traumatic circumstances (my father accidently ran over her). Chewie was a Terrier cross with attitude, a beautiful dog, and I miss her greatly. Not all veterinarians work in shelters. What attracted you to this area and how do you cope with the inevitable heartbreak? I have worked in shelters ever since I graduated - five years at the RSPCA, four years at the Animal Welfare League, and now back again at the RSPCA. I love working in shelters because I get to be a small part of a very beautiful process - that is, the journey of an animal from being surrendered by one family to being given a second chance by another loving family. Whenever people ask me how I cope in such a sad working environment, I always answer by saying the good work that happens at shelters easily outweighs the sad stuff. 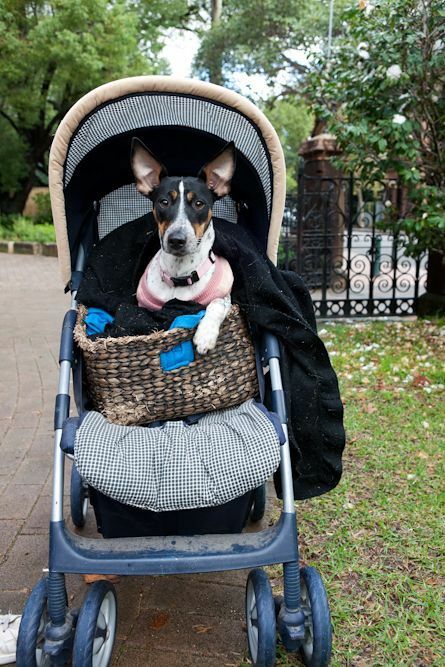 Pets in the Park, right in the heart of Sydney City. How did Pets in the Park come about? Pets in the Park really came about by chance. I have always had a strong desire to have a net positive affect on this world by donating my skills as a veterinarian to worthwhile causes. I have volunteered my time on de-sexing programs in India, Thailand, Bali, and worked at the RSPCA in Port Moresby. Pets in the Park is really an extension of my work overseas to try to make a difference to animals in Australia. About four years ago, a friend told me about a food ministry that he helped co-ordinate and the animals brought along by many of his clients. I asked him if I could donate my time and come along, and so the next Sunday I took a table and esky down to the park in Parramatta where this food ministry took place. It was last year, however, that Pets in the Park really took off when three friends (Vicki Cawsey, Linda Warlond and Leah Skelsey) joined me to set up Pets in the Park as a registered cherity and open another clinic in Darlinghurst. Most of the credit for the success of Pets in the Park lies with these three women. My partner, Laura Taylor, has also been a huge support to me and has helped Pets in the Park grow exponentially. 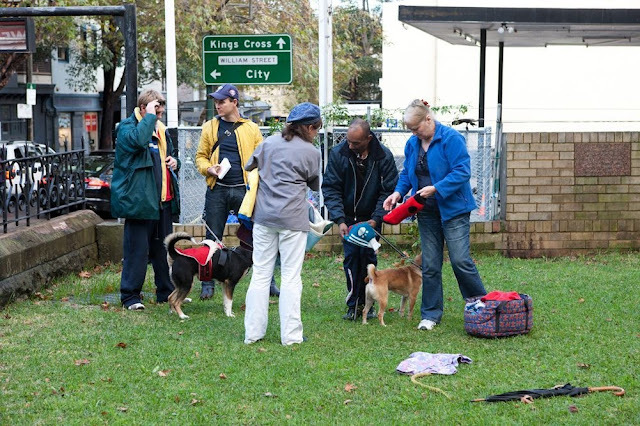 Pets in the Park's mission is to provide assistance to Sydney's homeless and less fortunate through caring for their pets. How we do this is through free pet clinics, where we provide free health checks, vaccinations, flea and worm treatment, and basic medications. 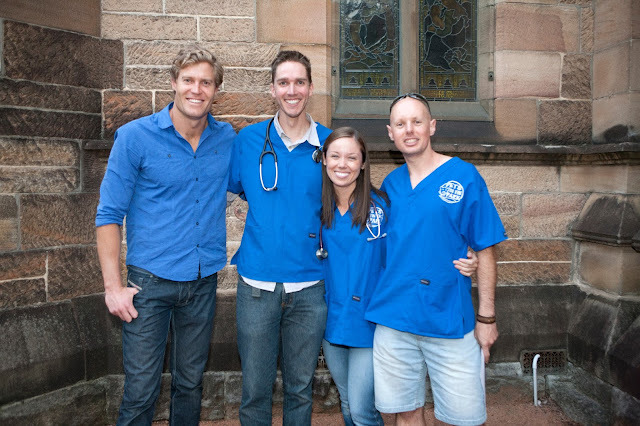 Currently we have two monthly clinics set up, one in Darlinghurst and one in Parramatta. The model for Pets in the Park is to choose a location for our clinics that ties in with human service providers, so that clients have access to support they may need while their pet is cared for by our volunteers. In Parramatta this is thanks to Stepping Stone Community Ministry and Parramatta Baptist Church, and in Darlinghurst this is thanks to St. John's Anglican Church and Rough Edges Ministry. We also run a quarterly de-sexing clinic, where animals recruited from our two clinics are transported to a veterinary hospital for free de-sexing and microchipping. Pets in the Park was successful in winning a City of Sydney Council Grant in January, which will cover about one third of our costs this year. The other two thirds of our budget is made up of donations, either monetary (we now have tax deductible status!) or in-kind from one of our wonderful corporate partners . 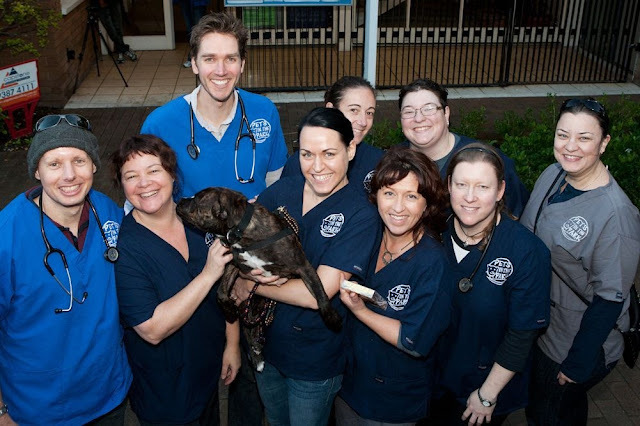 We have received amazing support from Virbac Animal Health, Bayer, Advanced Anaesthesia Specialists, Jurox, and Princes Highway Veterinary Clinic. All Pets in the Park health clinics and de-sexing clinics are completely staffed by volunteers. 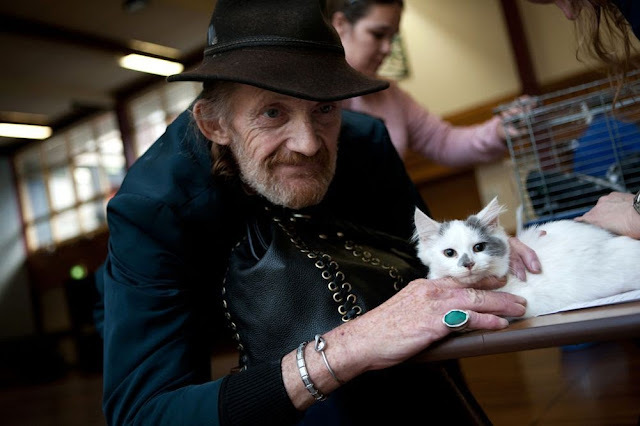 A client presents his cat for treatment at Pets in the Park. Practitioners offering low-cost or completely subsidised animal care are often criticised for taking business from local veterinarians. How do you address this concern? Pets in the Park cares for animals that would otherwise not receive veterinary care. We ensure this by running a strict client referral only service, where clients must bring a letter from a human service provider stating they are homeless or at high risk of homelessness in order to receive our assistance. This not only again ties human service providers in with people who are in need of assistance themselves, but also helps us maintain a good relationship with veterinarians who realise we only deal with genuine hardship cases and therefore are not taking any business away from their hospital. Can you tell us a little about your clients? Our clients are either homeless in the true sense of the word (i.e. living on the street), or experiencing transient homelessness (e.g. living in and out of shelters or hostels, or other emergency accommodation). Many of our clients suffer from mental illness, and/or have spent time in gaol (I have been asked to inspect a client's stab wound before), and so all of our volunteers need to have good interpersonal skills as well as a non-judgmental attitude. Twice in the past month I have stopped to talk to people with dogs begging on George Street in Sydney to find both were already clients of Pets in the Park! As well as feeling horribly sad for these poor people, I was encouraged to see that Pets in the Park is already making a difference to those clients and their animals who are most in need of assistance. How can veterinarians, vet students, vet nurses and others help? Pets in the Park is purely run by volunteers, and we need all the help we can get! We prefer veterinarians and veterinary nurses who are willing to commit to attending at least 50% of our clinics, as we like our volunteers to build strong connections with our regular clients. We also need help behind the scenes, including anyone with experience in marketing, fundraising and general administration. If anyone is interested in volunteering they can check out our website www.petsinthepark.org.au and email us mail@petsinthepark.org.au. Pets in the Park helps people in need who need their animals. Aside from supporting Pets in the Park, do you have any other suggestions for anyone who wants to improve the welfare of companion animals? It may sounds cliched, but every veterinarian and veterinary nurse has the opportunity to improve the welfare of companion animals in their care. It may be as simple as spending an extra five minutes with a client to educate them about breeding (or not breeding! ), or positive-reinforcement based training methods, or general husbandry. It all starts with a desire to have a positive influence on animals in your life, and not losing this desire to help no matter how long you have been in practice for. How do you manage to run a charity AND a PhD? Any tips for budding research students? Sometimes not very well! Running a charity does take up a lot of my time, and balancing the two (as well as still working part-time) is often very challenging. For example, I am writing these responses when I really should be reading some articles on feline leukemia virus......fortunately, I have a very understanding partner, family and friends. When you are passionate about a cause, and motivated to make a small difference in this world, somehow everything manages to fit in. Dr Chris Brown supports Pets in the Park.